Errez Design Studio, founded in 2009, arose out of an inspired idea called Biographical Design. Ruben and Katie Gutierrez, originally trained as Architects, desired to do something more unique and meaningful with their creative talents. Errez Design Studio has succeeded in consistently and accurately portraying the true spirit of each and every individual client. 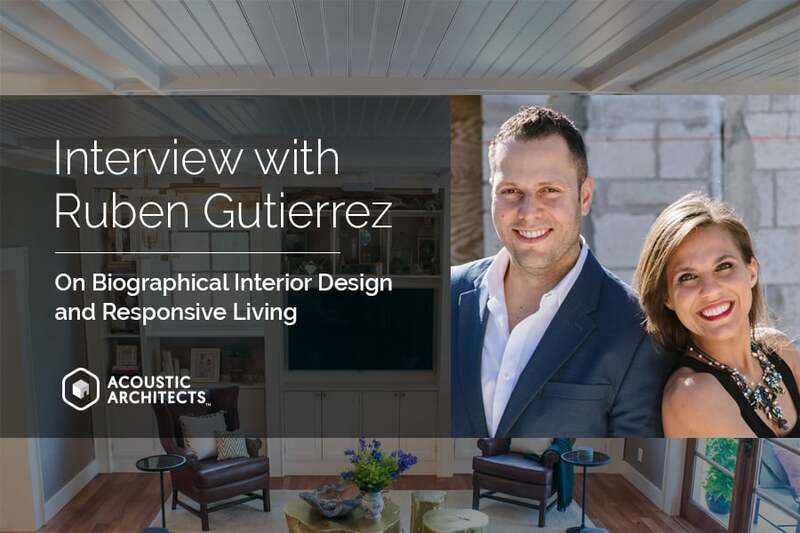 During a recent sit down with Ruben, he enlightened us on the innovative rarity of Biographical Design and strategically infusing home automation technology into Interior Design. Acoustic Architects (AA): Tell me about your story and how you got into the design world. Both Katie and I started out as Architects, but we knew we were ultimately looking for something more personal. We had the opportunity to do an interior design project and immediately loved the intimacy of that. So we decided to become interior designers. AA: How did you create Errez Design Studio? It was at the height of the recession. We both had lucrative jobs as architects, but we weren’t satisfied. One evening, over some wine, we discussed our dissatisfaction with our current situation. I decided to call a previous employer who had an interior design firm. Not only did she encourage us to go out on our own, but she also sent a client to us so we could get started. And the business grew from there. We were only 26 years old at the time. I kept one foot in the safety job for a long period of time. We immediately had a unique style but lacked the language for describing it. Katie and I both loved the idea of telling a client’s story through design. We were not following any of the current trends, and not trying to break the rules. But rather, just doing what felt right. Once we had language for our style, it was life-changing. We called it Biographical Design, the client’s living biography through interior design. AA: Tell us about your initial consultation with clients. Because our designs have such a unique component, we start each meeting with a Biographical Design meeting. This is done over food and drinks. For 3 hours or more, we talk, play games, and get to know the client. The games include quick questions and answers. For example, choose between the following…gold or silver…velvet or cotton. We ask clients to share their life stories and adventures. They have to let us get to know them so we can create a space that is uniquely theirs. Ultimately, the client has to be on board with our design philosophy. There are a lot of excellent designers out there. We are doing something very different. AA: Has your design philosophy evolved over the years? Errez is now approaching the 10 year anniversary as a design firm. We’ve narrowed down the process over the last 5 years into the biographical design. We really get into planning a space for a client to live, entertain, meditate, or spend time with family. This is their place for personal development and evolution. AA: Where has the concept of Biographical Design taken you? All over the country. We are an International Design Firm based in South Florida, but open to doing projects anywhere. Geography isn’t necessarily relevant. We’ve designed spaces in Costa Rica, Florida, New York, Arizona, and many other locations. AA: Which types of projects give you the most satisfaction? Currently, I’ve been heading up the residential designs, while Katie manages the corporate projects, like Orange Theory. Our workload is split at about 50/50. So we each get to do the type of work we are excited about. AA: All of your designs are very different. Do you have favorite colors or styles you prefer using? Being from South Florida, we tend to not shy away from big bright colors. Our design theory is the embodiment of “…something old, something new, something borrowed, something blue.” The finished product is a rich combination of the eclectic. AA: What is the “Something Blue” in your design philosophy? In the wedding tradition, something blue was a sign of fidelity. We took the liberty of changing the application. Our “something blue” means a pop of color. Whether it’s a bold pink or a sharp black, every room needs a moment of color or contrast. AA: How has smart-home innovation changed your approach to Interior design? We were amazed at the ability to give people control through interior design. To create an environment that shows who the person is, therefore empowering them to be in command of their space. We encourage clients to change their space as they evolve and grow. AA: How has working with Acoustic Architects influenced your design strategies? When we work with Acoustic Architects, they uplevel everything, making expansive suggestions. As an interior designer, I am used to seeing design in terms of aesthetics. Part of what makes it feel the way it feels is all the senses being unified. When sound, lighting, music, scent, climate, and other features are incorporated, it adds valuable layers to the process. AA: How has your relationship with Acoustic Architects evolved over the years? The Acoustic Architects team offers terminology that we don’t have. They know what we are asking for without much explanation and can fill in the gaps. As we’ve worked together over the years, the process has become really easy. Acoustic Architects: How are you and Acoustic Architects working symbiotically to meet each other’s needs as designers? The Acoustic Architects team always asks the right questions to gain a clear understanding of my objectives. From budget planning to installation, they create systems that uniquely respond to my clients’ needs. AA: On the subject of home automation, what are your clients most excited about? Do most people seem to be aware of the possibilities that are available? Many of my clients have some experience with home automation. However, as with any technological industry, clients are afraid to invest in devices that could be obsolete in a few years. I had a client in 2010 that installed iPod docks on the wall of every room in their home. Unfortunately, that technology is no longer needed. So, what I like about Acoustic Architects is their talent for designing systems that are widely adaptable and capable of evolving as technology changes. The benefit is a system that grows with you and maintains a higher shelf life. AA: What Smart Home products you have used in the past? We’ve helped our clients set scenes or moods by programming lighting, window treatments, and AV components. When we complete an install, we leave the lighting dimmed just so, turn the music on, light candles, and place fresh flowers. Programmable scenes allow clients, their guests, and their housekeepers to recreate that mood. AA: Any word of advice to new interior designers regarding home automation? I would advise new interior designers to make home automation part of the discussion with their clients. Plan for this to be part of the budget. Think about a project in terms of function and feel, rather than just appearance. Automation is an underutilized tool that can take projects to the next level and increase the clients’ enjoyment of their space. If you would like to learn more about infusing home automation into your interior design, feel free to connect with us. We will be happy to schedule a demo with you.